Over the past two years, accredited sites have detected asymptomatic disease in over 50,000 people. *Based on the average eight patients per day and 260 work days in a year. 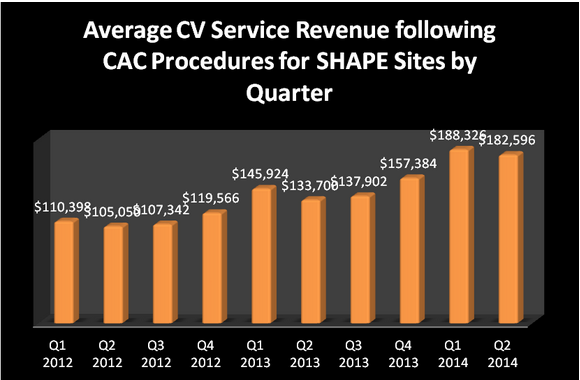 Also based on the national average figures of $129 per CAC and $382 in CV Services from CAC patients. The SHAPE Accredited Early Detection program has identified 48,553 individuals with asymptomatic coronary artery disease between 2012- 2014. Another 33,661 individuals were re-categorized as “low risk” for a cardiac event as the result of a 0 calcium score. 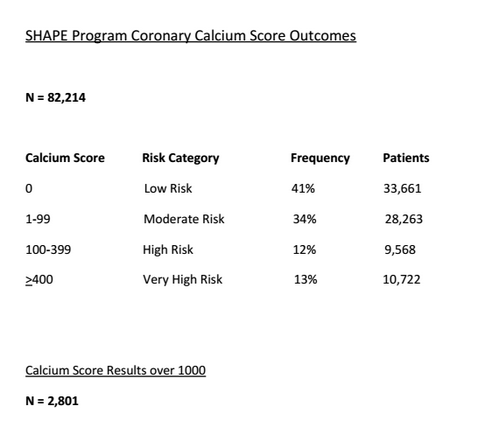 10,722 asymptomatic individuals were found to be at “very high” risk for a coronary event based upon a calcium score greater than 400. These subjects were at substantial risk for a heart attack or sudden cardiac death and have now been treated before the onset of an acute event. Finally, 2,801 asymptomatic individuals were identified having coronary calcium scores over 1000 between 2012-2014, as a result of the SHAPE Early Detection Program. Many of these patients went on for surgical intervention to reduce the imminent risk of a major cardiac event. On average, each Center of Excellence experiences an 800% increase in patient volumes. With increased referral volumes, a Center Of Excellence receives an added revenue stream that helps sustain the Center’s quality of services even in times of declining health service reimbursements. 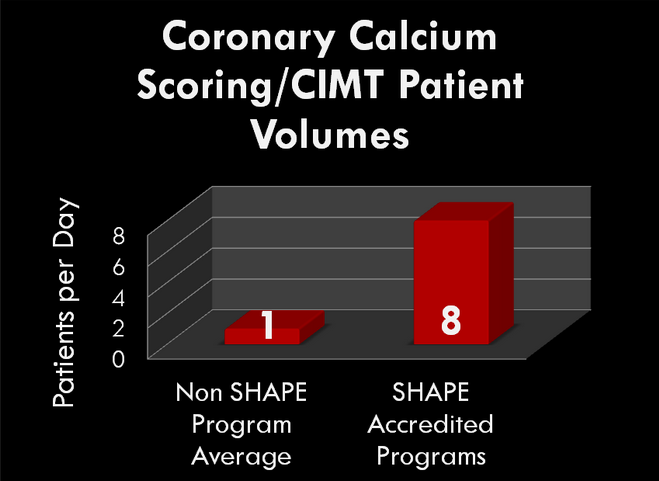 An analysis of hospitals and practices using direct to consumer marketing or internal referral building efforts to increase calcium scoring patients suggests that significant growth is attainable to strengthen the CT program, and the Preventive Cardiology, Imaging, and Cardiovascular Services units. Growth including new patient encounters, increased patient referrals, revenue enhancement (direct and post calcium scoring services), and community involvement via employer participation are suggested. 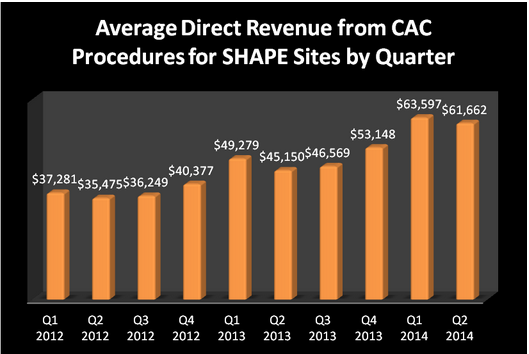 The goals and components of the SHAPE Early Detection program with International Accreditation provide for substantial overall growth of the coronary calcium scoring program resulting in an increased appropriate patient base and improved economic performance for both the CT department and hospital or practice as a whole. Patients referred for calcium scoring at SHAPE Accredited sites were consistent with published appropriateness criteria indicating that the referring physicians are selecting guideline indicated patients for testing.